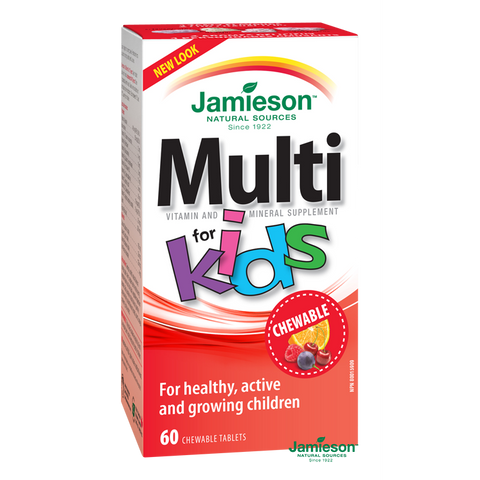 Jamieson Multivitamin for Kids is deliciously formulated to nourish growing bodies with essential nutrients, including iron, to promote healthy growth and development. This yummy kid-approved multivitamin is made with no artifical colours or flavours, and the animal shapes make it fun for kids to take their daily supplement! Non-medicinal ingredients: Natural flavours (orange, grape, cherry, morello cherry, raspberry, cranberry, citrus extract), natural colours (carmine, tomato powder, carrot root powder), vegetable stearic acid, vegetable magnesium stearate, citric acid, silica, sucralose, dextrose, sorbitol. Keep out of reach of children. This product contains enough iron to seriously harm a child. Children 3 to 13 years: Chew 1 tablet daily with a meal. Adolescents 14-18 years: Chew 2 tablets daily with a meal.